This homework is intended for you to learn and take the information from each YBTT300 home into the heart of your own teaching. These assignments will take time for you to digest and reflect, and like a good meal, it helps to digest with time for reflection. The anatomy segment is straightforward, and meant to help you learn to self study how the body works. You will be challenged to think outside of your “normal” thinking, and look at poses in a different way. Additionally, the philosophy assignment is not meant to be the limit of your inquiry into philosophy, but hopefully will act as a seed to plant thoughts and ideas to bloom in your heart mind. These questions are meant for you to reflect and connect to yourself. As a teacher, and as a human wandering through life. The time to “do” this assignment requires much to think about, yet does not require many words. Please take these questions as a way to broaden your view of yoga, and the assignment is simply a “by-product” of your own Svadhyaya (self study). May the practice of yoga be of benefit to ourselves and others. Please use Yoga Bloom Homework Template for Yoga Bloom YTT Homework. Keep this template for easy reference, and submit by email or mail to Cora. Deadline is one month prior to your next Module. 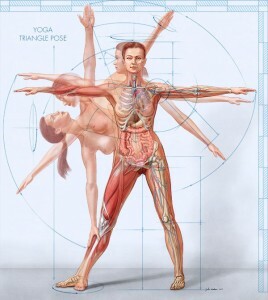 Using Light on Yoga, trace 3 standing poses and 3 seated poses and indicate what main muscles are used in each Asana. Scan or copy and send to Cora. Try to do this Anatomy Quiz – Self Test without looking up the answers. Time yourself and note your own learning. 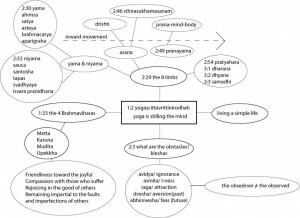 Review 3 translations of Patanjali’s Yoga Sutras. Pay attention to how these concepts may play into you as a yoga teacher, and in the classroom. If you are living your practice and how that may show up in the way you see and perceive your students. Purusha and Prakriti is always around us, so notice where this applies to daily life. Write a 300-400 word essay and discuss these concepts. How do the Yoga Sutras apply to your life? Using asana we are the subject and the object. As you practice asana, you are both directing and receiving instructions. Observe these dual roles. Become the director and observe the effects of your asana. Change the role to receiver and observe effects. In your practice, are you ever in a state of neither directing nor receiving? What happens then? In your own words, write one page summary of Pada I & II. List key Sanskrit terms and points. 3. TEACHING METHODOLOGY: Pick a theme and discuss what you would do in a class to support the theme. Choice of asanas, point of focus in the body, verbal instructions and other ways to support the “mood” of theme. What does this teach you about sequencing? 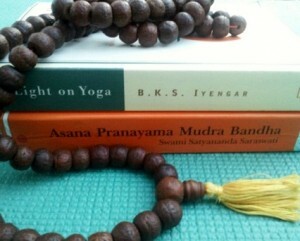 In each Yoga Bloom Advanced Training Module, you will choose 2-4 of these books to read. Reflect on what they teach you about sharing this practice. Write a 300-400 word essay about how this would effect you as a yoga teacher.